In the weeks before Jane and I got engaged we had discussed the topic of marriage and so by the time I proposed we actually had both our wedding date and honeymoon location in mind. Let me explain. Jane has an annual ritual of gluing assorted pictures in the pages of her diary at the start of each year, a mix of nature, people and religious images. One night we were at dinner and she was showing me these different pictures and on 31 December there was a photo of one of those over water bungalows with the thatched roof amidst the perfect clear water. Jane had it on her bucket list to visit such a place for a holiday. I remember nudging Jane and telling her that if we got married on 29 December we could be in a tropical bungalow in time for New Year Eve, just as her diary foretold! (I may have also tried to hint that this was a sign from God that we should get married this year). 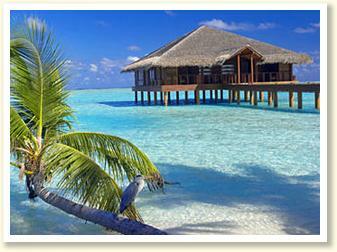 Even if it had not been an overwater bungalow I would have been definitely keen to have a relaxing honeymoon. I love the idea of a honeymoon that is a holiday and not a trip. One where we can basically sit around all day and there is absolutely nothing to be done! In the previous years when I have taken annual leave it has been to go overseas for a course and sightseeing and while they have been wonderful experiences, I always get back in need of a holiday to recover. So this honeymoon is so exciting because (a) it will be with my new wife Jane and (b) we get to spend it resting and relaxing. Not knowing anything about the world of overwater bungalows I went back to Google for advice. It turns out there are a lot of these Bungalow places! And generally they are situated in two main areas; French Polynesia in the Pacific Ocean and the Maldives in the Indian Ocean. We began by considering Bora Bora in French Polynesia as we had heard many good things from friends. Although I usually do my travel bookings myself it was very handy to instead contact a travel agent with our ideas and have them work out an itinerary for us. At one point we had four different agents working on itineraries (I am not sure if that is how it is supposed to work because I had to eventually break the news to three of them that they were not the chosen ones). We were about ready to book a particular resort in Bora Bora and I thought I’d try one more agent to see if he had any other suggestions, however he advised us of a very handy piece of information; that January, when we planned on being away, was actually wet season in that region. While we may be lucky enough to only get some quick afternoon storms we may also get a solid week of nonstop rain. After some discussion and research Jane and I decided to not take the risk and swing our honeymoon over the other side of the world, the Maldives. So the process began again of looking at the host of resorts available. Arriving there for New Year’s Eve meant that we had chosen one of the most pricey times of the year and the overwater bungalows ranged in cost from ‘expensive’ to ‘mortgage-your-house-type-expensive’. We realise we could have hired a beachside unit in Queensland for a lot less money but hey, neither of us live wildly opulent lives, we won’t be doing it again and don’t forget…Jane’s diary had already spoken on where we must go! After sorting through a whole list we were left with a couple of choices and we ended up finding a nice island in the Maldives which was not too big, with blue skies, clear water and a good price. At the same time we discovered a great deal on a five day cruise where you could ‘bring a mate for free’ so I booked that and will bring my new mate Jane on the cruise after our time at the resort. We are both looking forward to this time together once married to relax and switch off from the rest of the world before coming back to Sydney and beginning the regular cycle of life as husband and wife. Posted in Uncategorized and tagged Bora Bora, engagement, honeymoon, Maldives, marriage, overwater bungalow, proposal, wedding. Bookmark the permalink. I have always wanted to visit one of those places. I hope you guys have a wonderful time!